The latest Web Trends Report from mobile software solutions provider Netbiscuits is shedding light on the fragmentation of the mobile market, revealing that the Top 100 devices cover just 67 percent of global Web traffic. Among the top 100 devices are 26 unique screen sizes, ranging from 2.35 inches to 10.1 inches. In fact, just a year ago, there were only four tablet devices among the top 100 devices, but since then, that number has more than doubled to 10. When it comes to Apple, the report shows that there are an increasing number of older Apple devices being used as new devices tend to be slow in achieving full market penetration. Plus, Apple’s newest phones, the iPhone 5S and 5C are further fragmenting the market. Although both devices have the same screen size, they are built to different specifications and deliver different experiences. Currently Apple’s fragmentation is at an all time high, with four device types on the market and five different operation systems in use. It is important to note that the top 10 devices account for just 47 percent of total traffic on the Netbiscuits Cloud Platform, which is down from 48 percent just three months ago. That said, device use also varies by location. For example, the top 10 devices in Latin America represent just 35 percent of the total Web traffic, while they represent nearly half (49 percent) in Western Europe. 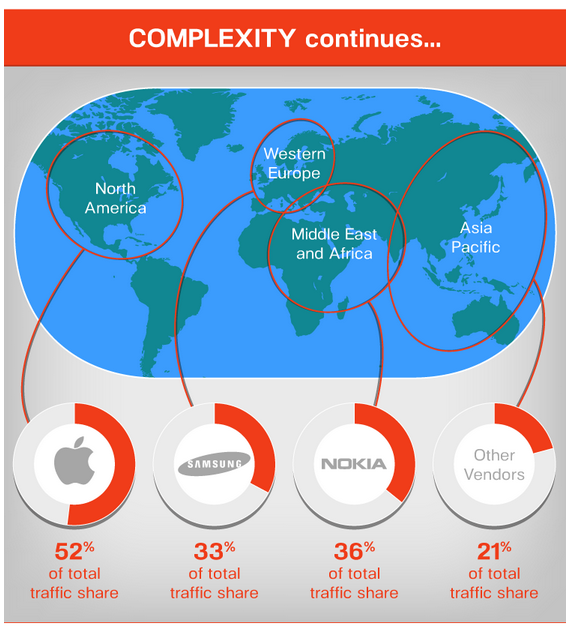 In addition, the study shows that Apple devices represented more than half of the North American market, while Samsung has a third of the market share in Western Europe and Nokia dominates the Middle East with 36 percent of global traffic share.